Frank Fox : Surf Bathing in Australia, 1911. 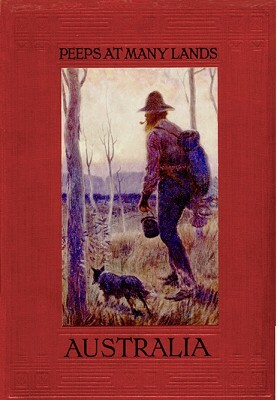 Illustrations by Percy F.S. Spence. Adam and Charles Black, London, 1911. 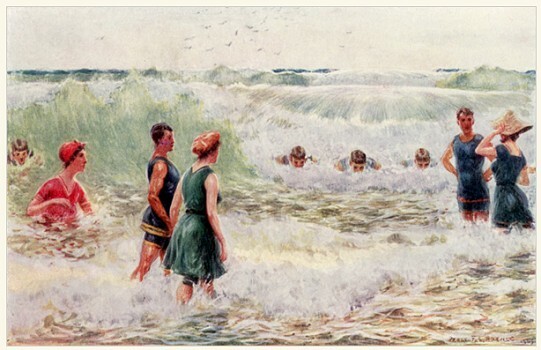 A book essentially written for children, the highlight of this work is the colour illustraton of surf-bathing by Percy Spence on page 73. Few European or American children can enjoy such sea beaches as are scattered all over the Australian coast. They are beautiful white or creamy stretches of firm sand, curving round bays, sometimes just a mile in length, sometimes of huge extent, as the Ninety Miles Beach in Victoria. The water on the Australian coast is usually of a brilliant blue, and it breaks into white foam as it rolls on to the shelving sand. Around Carram, Aspendale, Mentone and Brighton, near Melbourne; at Narrabeen, Manly, Cronulla, Coogee, near Sydney; and at a hundred other places on the Australian coast, are beautiful beaches. You may see on holidays hundreds of thousands of people—men, women, and children—surf-bathing or paddling on the sands. It is quite safe fun, too, if you take care not to go out too far and so get caught in the undertow. Sharks are common on the Australian coast, but they will not venture into the broken water of surf beaches. But you must not bathe, except in enclosed baths in the harbours, or you run a serious risk of providing a meal for a voracious shark. Sharks are quite the most dangerous foes of man in Australia. There have been some heroic incidents arising from attacks by sharks on human beings. An instance: On a New South Wales beach two brothers were bathing, and they had gone outside of the broken surf water. One was attacked by a shark. As a rule, however, the shark kills with one bite, attacking the trunk of its victim, which it can sever in two with one great snap of its jaws. Children on the Australian coast are very fond of the water. They learn to swim almost as soon as they can walk. Through exposure to the sun whilst bathing their skin gets a coppery colour, and except for their Anglo-Saxon eyes you would imagine many Australian youngsters to be Arabs. 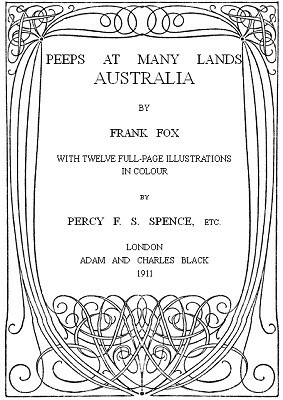 Geoff Cater (2012) : Frank Fox : Peeps at Many Lands - Australia, 1911.